President Trump's initial failure to condemn white supremacy on Saturday was too much for Kenneth Frazier. 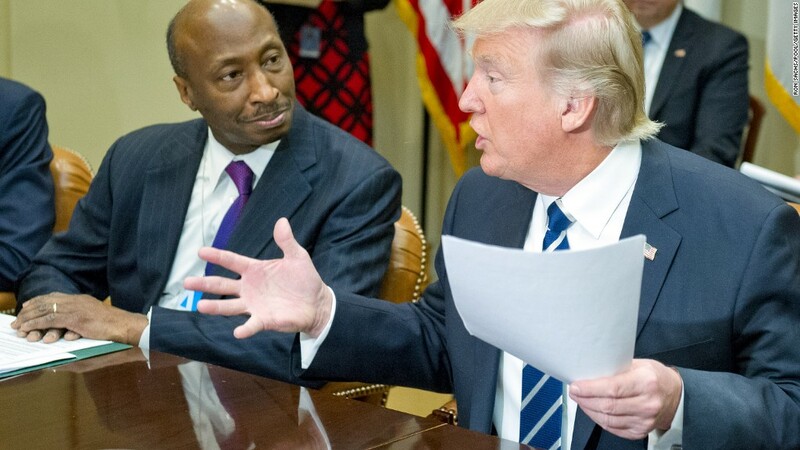 Early Monday morning, the head of the pharma giant Merck (MRK) -- and one of America's most prominent black CEOs -- abruptly quit Trump's manufacturing council. Frazier's message was clear: "America's leaders must honor our fundamental values by clearly rejecting expressions of hatred, bigotry and group supremacy." Trump quickly responded by bashing Frazier. He tweeted that the Merck CEO "will have more time to LOWER RIPOFF DRUG PRICES!" Hours later, Trump denounced the KKK, neo-Nazis and white supremacists as "repugnant." Throughout the day, other CEOs on the manufacturing council condemned racism after the weekend's white nationalist rally in Charlottesville, Virginia. By Monday night, two others had joined Frazier in leaving. Under Armour's (UA) Kevin Plank had earlier tweeted a strong rejection of racism. Then, just after 8 p.m. ET, his company released a statement saying that he would step down. "Under Armour engages in innovation and sports, not politics," Plank said. Later Monday evening, Intel (INTC) CEO Brian Krzanich said in a blog post that he, too, was resigning "to call attention to the serious harm our divided political climate is causing to critical issues." CNNMoney asked the approximately two dozen executives on the council whether they would stay. Several of them denounced hate and bigotry, others declined to comment, and some did not respond at all. But at least seven companies or executives said that they would remain with the council, which was formed in January to advise Trump on manufacturing growth -- a key focus of the president's campaign. Representatives for at least five other companies -- Dow Chemical (DOW), Whirlpool (WHR), Campbell Soup (CPB), International Paper (IP) and Nucor (NUE) -- echoed similar sentiments. Dell said there was "no change" in how it is "engaging with the Trump administration" on policy issues that affect the company. Frazier, Plank and Krzanich are not the first CEOs to drop out of a Trump advisory role. At first, Tesla (TSLA) and SpaceX CEO Elon Musk defended his roles on Trump's manufacturing and economic advisory councils. While Musk publicly and repeatedly rebuked several Trump policies, including the travel ban, he said he believed having a seat at the table was "doing good." The clean energy advocate spoke publicly about wanting to advise Trump on climate issues, even though the president downplayed the problem. Musk eventually gave up. After Trump pulled out of the Paris climate agreement in June, he left both councils. "Leaving Paris is not good for America or the world," Musk tweeted at the time. He had earlier said that he had "done all I can to advise directly to POTUS, through others in WH & via councils." Disney's (DIS) Bob Iger, another member of the economic advisory council, also quit after the Paris decision. And at least one more departure from the manufacturing group may be in the works. The AFL-CIO, which has two members on the council, said Monday that it denounces "bigoted domestic terrorists" and called on Trump to follow. Its president, Richard Trumka, made similar comments online Sunday. By Monday afternoon the AFL-CIO said it was "assessing" its role in the manufacturing group -- which it said "has yet to hold any real meeting." "While the AFL-CIO will remain a powerful voice for the freedoms of working people, there are real questions about the effectiveness of this council to deliver real policy that lifts working families," the organization said. In other words: Maybe this just isn't worth it. --CNNMoney's Ahiza Garcia, Olivia Chang, Shen Lu and Jordan Valinsky contributed to this story.